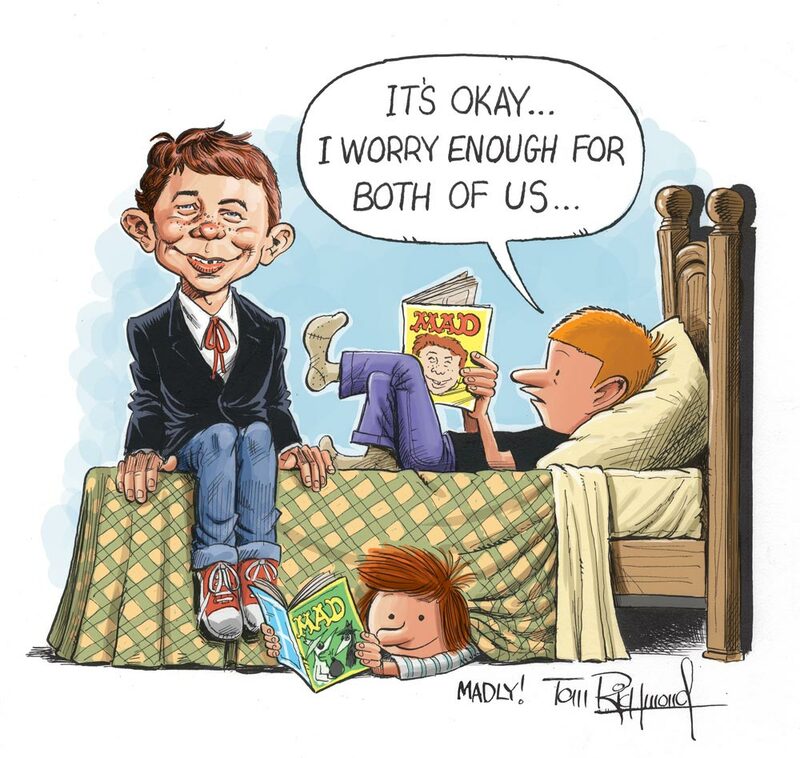 Tom Richmond has been the wonderful illustrator for Mad magazine since 2000. He has left his very wonderful touch on Mad. It is just some of the most amazing illustration work around. Now he has tackled Petey and this is just wonderful. Tom is also the president of the NCS so remember Tom, with great power comes great... well you know the rest. Thanks for being part of our team Tom! A Thanksgiving Tradition: $8.80 Off Custom Postage Sheets! Use Code: ZPOSTAGESALE Ends Tomorrow! 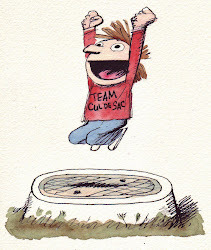 http://www.comicsbeat.com/2011/11/22/nice-art-nick-galifianakis-team-cul-de-sac-contribution/ from Heidi MacDonald's site. http://www.washingtonpost.com/blogs/comic-riffs/post/team-cul-de-sac-galifianakis-beautiful-nod-to-richard-thompson/2011/11/22/gIQAURexkN_blog.html#pagebreak from Mike Cavna's site. Thank you Nick..Nick Galifianakis says and draws his tribute to his friend Richard Thompson. 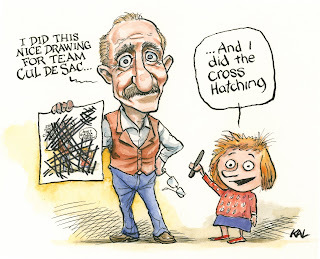 "The Searleing of Richard Thompson," or, "The Blessing of the Heir" There are very few geniuses in the world. The rest of us can aspire only to recognize one, and I've had the rare privilege of doing so in my longtime friend. For 25 years, I have been in Richard Thompson's studio to witness his evolution, from lavish pencil drawings to rich oil caricatures through to his brilliant comic strip. 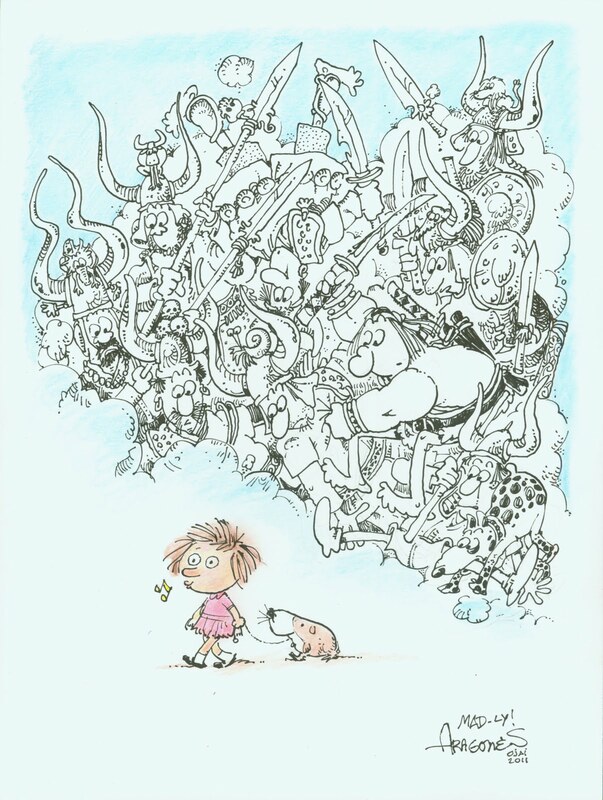 His depth of talent, diversity of vision and unique interpretation of the world around him are so rare that I can only think of one other artist whom I would equate with Richard -- the great Ronald Searle. 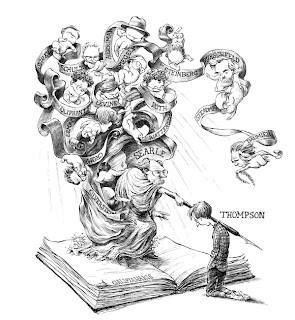 It's not my intention to diminish other talented and important cartoonists, though contemporary greats already agree that Thompson's work merits special distinction. As such my illustration depicts the acknowledgment of his place in the history of what we do: Surrounded by a pantheon of cartoonist gods, Searle blesses his heir. Of course, there are giants of cartooning missing. Where are Rowlandson and Nast? Trudeau, Breathed, Chast or Trondheim? The virtuoso, Chuck Jones? They're all there, represented by the anonymous cherub clinging to the master's shoulder. And so the mantle passes from Searle to Thompson... my grandiose tribute to the humblest of men. in my life and help shape me into the person I am today. Without advice years ago, I am not sure I would have never been brave enough to take on a project as enormous as this one. It was a pleasure to introduce Richard to Sergio at Baltimorecon in 2010. Thank you Sergio! "Adam @ Home" had a "Cul De Sac" reference Saturday. Chris Sparks drawing Cul de Sac? So I (Chris)decided to make some changes to my art and still decided to submit this to Andrews McMeel Publishing. I am not a cartoonist but I asked everyone else to contribute so I thought it was only fair to give everyone a laugh. 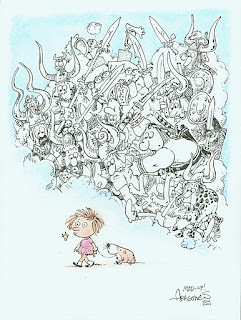 I now have even more respect for everyone who contributed and to Richard Thompson. Damn, this is not easy. Thank you to everyone who contributed. We will have news about the book/auction and maybe some other cool surprises very soon! Do you need stamps for the Holidays?